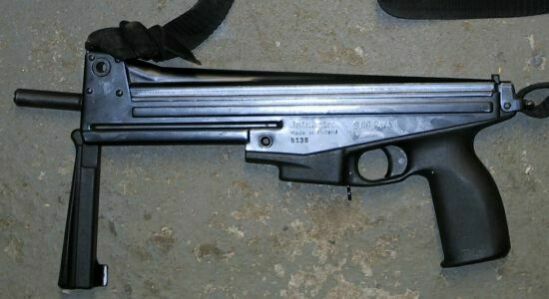 Caliber: 9x19mm Luger/Parabellum Weight: 1.65 kg empty Length: 400 mm Barrel lenght: Rate of fire: 650 round per minute Magazine capacity: 20 or 40 rounds Jati-Matic submachine gun was designed by Jali Timari and manufactured at Tampereen Asepaja OY, Finland, in 1980 - 1987. In 1995 the Jati-Matic apeared again, under the name of GG-95 PDW from finnish company Oy Golden Gun Ltd. Jati-Matic is a blowback operated, select-fire submachine gun. The bolt recoils up an inclined plane at angle to the barrel, giving an element of braking to the bolt, and also resisting the upward movement of the barrel during the fire. The pistol grip is located higher than on many other SMGs, giving the better control over the recoil. Jati-Matic has no buttstock and has folding forward grip, which also acts as a cocking handle when opened. The receiver is made from pressed steel with hinged cover. The selection of the fire mode (single or full auto) can be done with different trigger pulls - short pull produced single shots, long pull - full auto fire.